Fujifilm has unveiled the X-T30, its latest APS-C mirrorless camera. The X-T30 provides many of the features found in the higher-end X-T3, including its 26.1MP X-Trans sensor and X-Processor 4 Quad Core-CPU, along with some autofocus improvements that will come to the X-T3 later via a firmware update. The X-T30 offers a hybrid AF system with 425 points across the entire frame, and boasts faster face detection compared to its X-T20 predecessor. Eye detection AF can be used in AF-C mode, and phase detection AF is now usable in lower light conditions. On the video front, the X-T30 offers a surprisingly robust feature set including 4K/30p and 10-bit 4:2:2 output via HDMI and 8-bit 4:2:0 internal recording. That's one of a few key differences between the X-T30 and X-T3 – upgrading to the X-T3 gets you 10-bit 4:2:0 internal and 4K/60p. The X-T30 is an altogether smaller and lighter camera than the X-T3 (383 g / 13.5 oz compared to 539 g / 19 oz) and offers a smaller, lower-resolution viewfinder – 0.62x and 2.36M-dot to the X-T3's 0.75x and 3.69M-dot EVF. A 3" 1.04M-dot touchscreen tilts on one axis, and a single card slot is offered. A new, lower native ISO of 160 is offered, and burst shooting with continuous autofocus tops out at 20 fps (8 fps with mechanical shutter). Bluetooth connectivity has been added on top of the Wi-Fi offered by the X-T20, and battery life sees a slight improvement over its predecessor as well – 380 shots versus 350 shots per charge (CIPA). The Fujifilm X-T30 will go on sale in March for $899 body-only, $999 with XC 15-45mm F3.5-5.6 OIS Power Zoom or $1299 with 18-55mm F2.8-4. 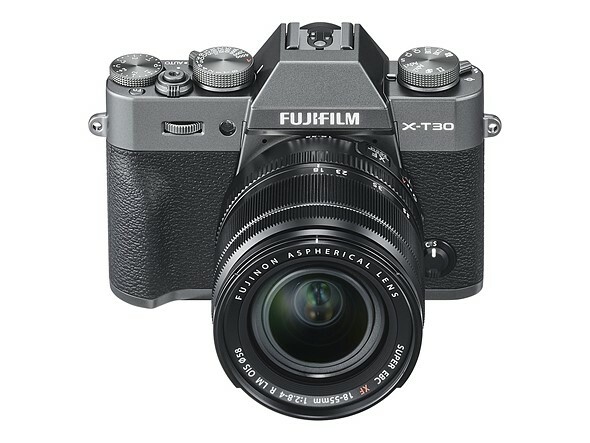 At launch the X-T30 will be offered in black or silver, with a handsome charcoal silver option to follow in June. Valhalla, New York, February 14, 2019 – FUJIFILM Corporation today unveiled several new announcements for the FUJIFILM X Series lineup, including the launch of the FUJIFILM X-T30 (X-T30), its new mirrorless digital camera that provides photographers of all levels with enhancements in image quality at greater speed and accuracy. Fujifilm also announced the FUJINON XF16mmF2.8 R WR wide angle lens with a compact, lightweight and weather-resistant design for its XF family of interchangeable lenses. Professional Performance: The 26.1MP BSI APS-C X-Trans CMOS 4 image sensor and X-Processor 4 quad-core CPU combination allows for reliable and accurate AF and Face Detection performance when capturing high-resolution stills or recording 4k video of moving subjects. Advanced Image Quality: The new X-Processor 4 Quad Core-CPU doubles the speed of face-detection for moving people compared to the X-T20. Additionally, eye-detection AF now works in AF-C mode, which results in accurate focus-tracking for moving portrait subjects. The low-light limit for phase detection AF has been expanded even more from the conventional +0.5EV to -3EV, to allow for operation in a wide range of lighting scenarios. Easy-to-Use Design: Offers 3 inch touch LCD with 2-way tilting and optimal touch screen to capture images easily in challenging situations. Provides advanced SR Auto mode –easily activated with a lever -- to automatically choose the optimum shooting settings out of 58 presets for any given scene. Mobility: Built-in Wi-Fi® and Bluetooth V.4.2 offers digital communication with the free FUJIFILM Camera Remote app to wirelessly control the camera or share images to smart devices. Fast AF Speed: The X-T3's new firmware update provides the camera with a new AF algorithm, which improves the AF speed from previous versions, regardless if the subject is located a short distance or farther away.